The Energy Web Atlas’ Liquefied Natural Gas (LNG) and US Gas Processing (GP) map is a comprehensive source of facility and project data. The web-based platform allows users to access the latest project data (including facility status and ownership details), detailed pipeline information, vessel/shipping information and more. The platform serves as a single reference source for all LNG projects across the globe plus gas processing plants within the United States allowing users to interrogate project information, export and manipulate data, produce production quality bespoke maps, and create custom reports. . The ESRI-based platform is updated in real time by a dedicated support team, thereby ensuring that the latest LNG and GP data—regardless of project location or status—is just a click away. The EWA LNG map is an evolution of Petroleum Economist's Interactive World LNG Map, which began tracking LNG projects around the globe in 2012. The US gas plant map and data is an evolution of Hydrocarbon Processing’s US Gas Processing Plant Directory, which began tracking plant data in 2014. Energy Web Atlas is part of the Gulf Energy Information. LNG | Liquified natural gas is a clear, colourless and non-toxic liquid which forms when natural gas cooled to around -162°C (-260°F), the boiling point of its main constituent methane (CH4), so that it becomes liquid. The process, known as liquefaction, reduces its volume by a factor of 600, making it more convenient and less dangerous to store and transport. Natural gas is liquefied in a liquefaction plant, transported and stored chilled and under slight pressure, before being converted back into a gas at a regasification plant. 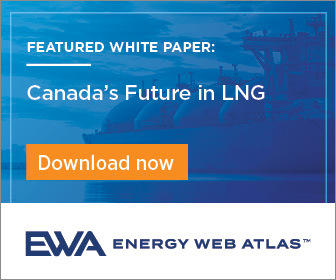 In its liquid state, LNG will not ignite. The regasified product is then piped to homes, businesses and industries where it is burnt for heat or to generate electricity. LNG is now also emerging as a cost-competitive and cleaner fuel, especially for shipping and heavy-duty road transport.